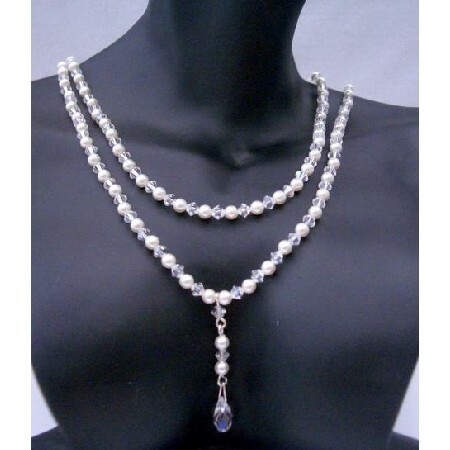 This gorgeous double strand Swarovski Crystals & Pearls Necklace is made with Swarovski White Pearls & Clear Crystals Bicone with drop Swarovski briolette Pendant 6010 series 11mm x 5.5mm. Our beaded Necklace features gorgeous with Swarovski Crystals & Pearls. Each has been hand-matched & hand strung; the Necklace & earrings is The ultimate layering piece or bold & beautiful on its own you must-have thisMake your dream comes true it is your special day Let us pamper you by creating the most lovely & perfect bridal jewelry just for you & your bridal party.